Biography of German Neoclassical Sculptor and His Character Heads. 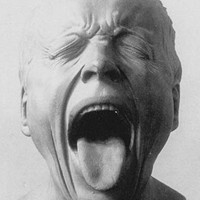 A highly innovative contributor to late Baroque sculpture and early strands of Neoclassical sculpture, the German-born Austrian artist Franz Messerschmidt, sometimes referred to as one of the best expressionist neoclassical sculptors, is best known for his series of expressionistic portrait busts - known as character heads - which he sculpted in lead and alabaster. These so-called "Characterkopfe" were produced as the sculptor fell into mental illness. As a result, some art historians have suggested they were not so much studies in pathognomy or physiognomy, as attempts by the artist to exorcise his private demons. Whatever the case, these heads are startlingly modern works of sculpture, and reveal Messerschmidt's exceptional talent for combining realism with classical stylization. He produced 64 Heads in total, including: Character Head: The Beaked Man (1770, Osterreichische Galerie, Vienna); Character Head: Ill Humoured Man (1770-83, Private Collection); and Character Head: The Hanged Man (1770-83, Osterreichische Galerie, Vienna). Grimacing head No. 13 "Der Speyer"
Messerschmidt was born in Wurttemburg, southwestern Germany, in 1736, but soon moved to Munich to live with his uncle, the sculptor Johann Baptist Straub. Straub was an important German sculptor in the style of Rococo art and his workshop was one of the most important of the day. Messerschmidt trained here first, before joining another sculptor-uncle in Graz, Austria - the Baroque carver Philipp Jakob Straub. In late 1755, Messerschmidt graduated from the Academy of Fine Arts in Vienna, and became a pupil of the artist Jacob Schletterer. On graduation, Messerschmidt worked at the Imperial Arms Collection, creating bronze busts and reliefs of the Imperial couple, Empress Maria Theresia and her consort Franz I of Lothringen. Created under the overarching influence of Balthasar Ferdinand Moll, these are Messerschmidt's first known works of art, which were highly animated in the late Baroque style. In 1769, Messerschmidt unveiled his portrait bust of the court physician Gerard van Swieten, which had been commissioned by the Empress. The bust showed that Messerschmidt had moved on from Baroque art, and revealed clear signs of the new style of Neoclassical art. Neoclassicism was a general movement that looked back to the values of Ancient Greece and Rome for inspiration. In contrast to Baroque and Rococo, it was idealistic and awe-inspiring. Messerschmidt produced several portrait busts which were influenced by Roman republican portraits. In 1765, he spent several months in Rome, working with the art historian Johann Winckelmann, a pioneering Hellenist, who was one of the first experts to articulate the difference between Greek art, Greco-Roman and Roman art. After this period of study and discussion in Rome, Messerschmidt's modelling became crisper and smoother, along Hellenistic lines. In fact, over the next century, several European cities, including Messerschmidt's Munich would be transformed into living museums dedicated to Neoclassical architecture and sculpture. Around 1770, Messerschmidt began to work on his so-called character heads ("Charakterkopfe"). As with several modern artists after him, including Vincent Van Gogh and Edvard Munch, it is thought that Messerschmidt's genius in these works may have been linked to the onset of a mental illness, induced by hallucinations and paranoia. The heads represent a series of men whose faces are contorted into various grimaces. It is believed that Messerschmidt may have suffered from undiagnosed Crohn's disease, which caused him endless discomfort. According to the German author Friedrich Nicolai who visited Messerschmidt in his studio, the sculptor used to pinch his lower ribs to focus his thoughts away from his suffering. He then observed his grimaces in the mirror and set about recording them in bronze and marble. His intention, he told the author was to represent the 64 "canonical grimaces" of the human face using himself as a template. Messerschmidt also seemed to suffer from severe hallucinations: dreams of spirits visiting him at night and torturing him. 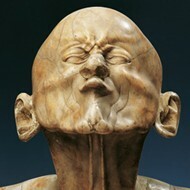 One of Messerschmidt's most famous heads, Character Head: The Beaked Man (1770, Osterreichische Galerie, Vienna), carved from alabaster was the result of one of these terrifying dreams. Messerschmidt sought to arrange his grimaces into a scientific system which he believed would benefit others in similar distress. Other examples of Heads include: Character Head: Ill Humoured Man (1770-83, Private collection), sculpted in lead; and Character Head: Incapable Bassoonist (1770-83, Private collection), fashioned in tin alloy. A celebrated metalworker, Messerschidt was highly interested in the composition of various alloys. The majority of his busts are made in lead, then given a fine silver finish. Other examples include Character Head: The Arch-Evil Man (1770-83, Osterreichische Galerie, Vienna); Character Head: The Gentle, Quiet Sleep (1770-1783, Museum of Fine Arts, Budapest); Character Head: The Hanged Man (1770-83, Osterreichische Galerie); and Character Head: The Lecher (1770-83, Osterreichische Galerie). To learn how to judge artists like the Neoclassical sculptor Franz Xaver Messerschmidt, see: How to Appreciate Sculpture. For later works, please see: How to Appreciate Modern Sculpture. After the 1770's, Messerschmidt found himself increasingly at odds with his peers, many of whom ridiculed his head sculptures - an attitude which may have further aggravated his mental condition. In 1774, when he applied for the vacant position of leading professor at the Academy where he had been teaching for five years, he was instead, expelled. A letter to the Empress explained that Messerschmidt had a 'confusion of the head'. In bitterness, Messerschmidt retreated into retirement, devoting himself exclusively to his busts until he died in 1783. After his death, 69 heads were found in his studio, of which only 43 survive today.